This super-simple recipe is healthy, comes together in a cinch, and is so wonderfully full-flavored. We love it! This recipe starts out vegan, but you can customize the toppings to add dairy or even a little meat if the carnivores like. 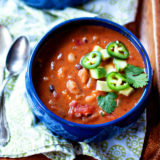 What do you do when you’ve a hankering for black bean soup, but you only have half the amount of black beans you need? You make up a new recipe, that’s what. And you also get to use the word “hankering” – bonus! 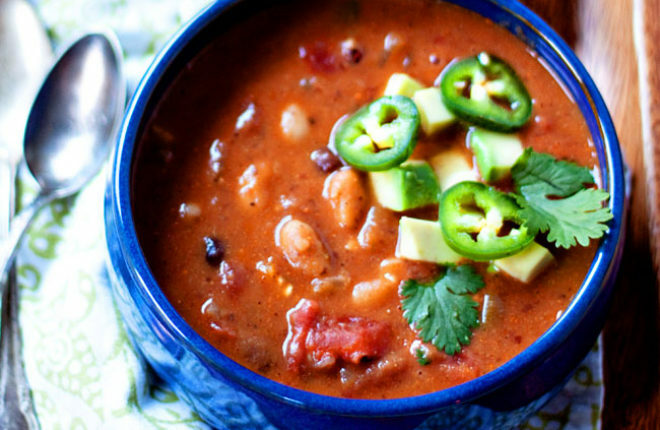 If black bean soup is awesome, black and white bean soup is bound to be awesome too, right? 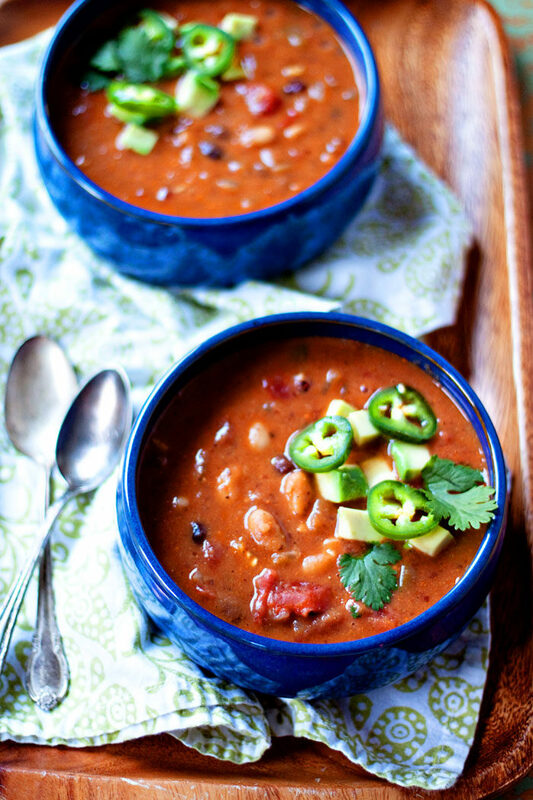 Well, maybe it’s not a guarantee … but I kind of think this Jalapeno Black Bean & White Bean Soup is, indeed, awesome. And I hope you do too. 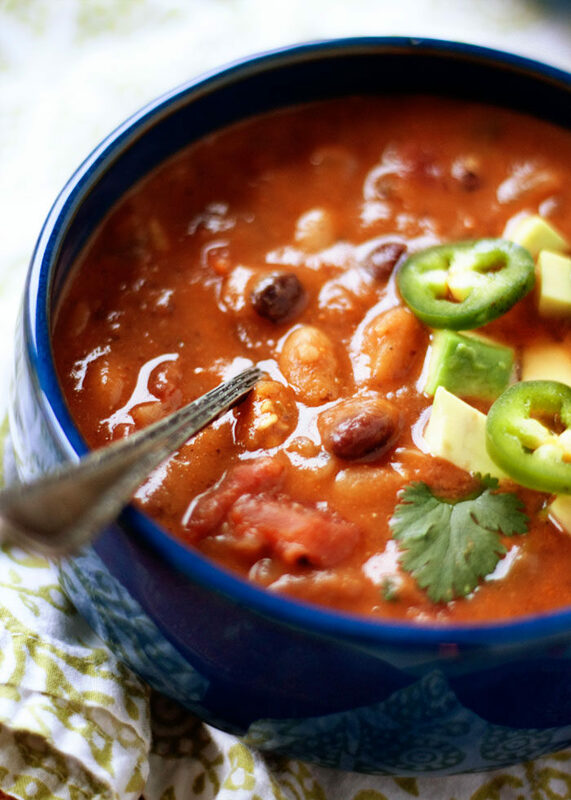 This is basically a version of my favorite black bean soup recipe (that I have yet to share – criminal, I know), but with half the black beans swapped out for white. The result? Something somehow richer, and definitely creamier, than its predecessor. I’ve had a run of weak jalapenos lately, so this time, I put the whole thing in, seeds and all. It was the perfect level of heat for us. Tread lightly if you’re wary of too much heat, though. Perhaps start with the flesh and a couple of seeds. Or, if you love the heat, just go all in. You can always cool it down with a dollop of sour cream (vegan if you like), after all. The toppings are a must. Sour cream, cheese if you do dairy (or a vegan cheese, even, if you don’t), creamy avocado, and/or cilantro. Yes please. It’s a black and white issue: this soup is tasty! Set a medium soup pot over medium heat. When hot, add the olive oil. Add the onions. Saute, stirring occasionally, until transluscent, about 5 minutes. Add the garlic and the oregano, and cook, stirring frequently, for one minute. Add the cumin, jalapeno pepper, beans, tomatoes, broth, 1/2 teaspoon salt, and 1/8 teaspoon pepper. Bring to a boil and then lower the heat to medium-low to simmer. Simmer uncovered until slightly reduced and thickened, about 25 minutes. Remove from heat and let cool until safe to handle. Remove about 3 cups of the soup and carefully pour it in a blender. Puree. Alternately, you can remove the 3 cups of soup and puree what’s in the pot with an immersion blender. Combine all of the soup back in the original pot and set again over heat until soup returns to a simmer. Add lime juice. Taste and add additional salt and pepper if desired. * I suggest tasting a bit of the flesh of the pepper before deciding how much to put in. Jalapenos can really vary in heat. If the flesh is mild (sometimes it’s so mild it tastes like a bell pepper!) and you want some heat, you will probably want to add some seeds. If the flesh is already spicy, you may want to omit the seeds altogether. Add cooked, shredded chicken as a topper to the meat-eaters’ servings. Just made this Vegetarian dish with a bit of Boca Crumbles. It was just great for an evening dinner on the Lanai with a cool breeze out of the North for a comfortable 81. The dish was a bit thin, perhaps I pureed a bit too much. The taste was perfect and followed the directions to the tee. Wow, that sounds like the perfect setting! Great idea to add Boca Crumbles. 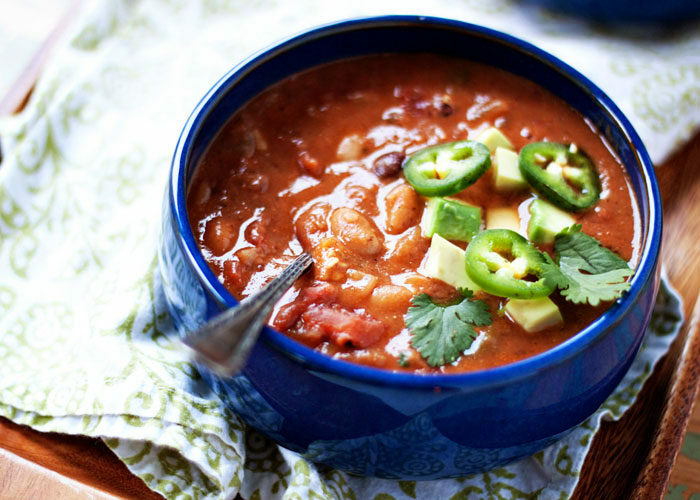 The soup is a little thinner than your typical black bean soup; if you want to thicken it up next time, you might want to try another can or two of beans. Thanks so much for your comment! Easy and delicious. I added a spicy Field Roast sausage. YUM. Oooh, I will need to try that too! Love me some Field Roast.